The city heats up with the start of the Scotiabank Caribbean Carnival which runs from July 7 till August 9. Moving from Nathan Phillips Square, which is currently full of Pan Am stuff, the steel band and Mas dancers are at Metro Hall's David Pecaut Square. 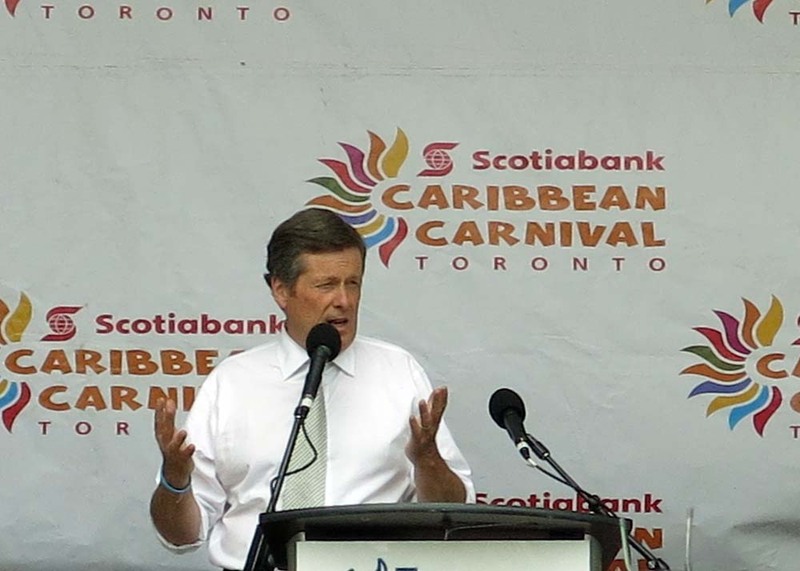 "Scotiabank Toronto Caribbean Carnival is an exciting three-week cultural explosion of Caribbean music, cuisine, revelry as well as visual and performing arts. Join us as we celebrate our 48th anniversary. We’re bigger and better than ever!" 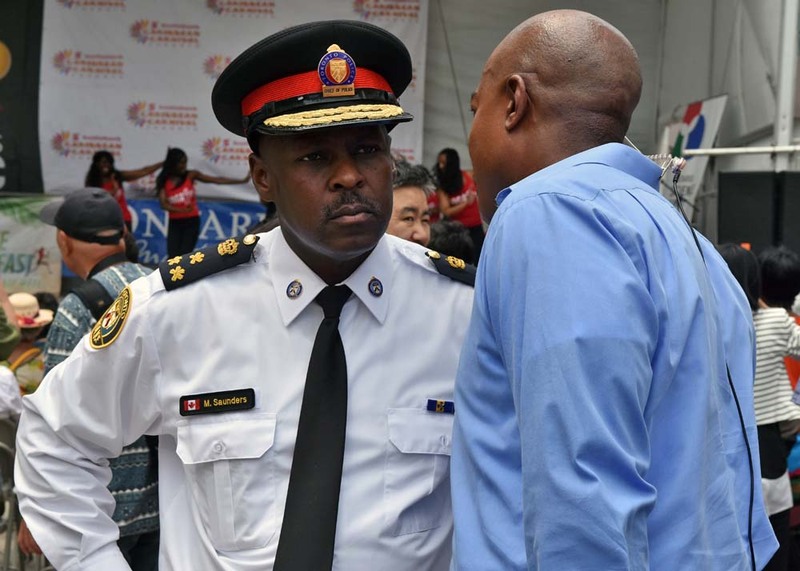 VIPs including Mayor John Tory, Minister of Tourism, Culture and Sport Michael Coteau, Toronto Police Chief Mark Saunders and Festival CEO Denise Herrera-Jackson, attended the noon hour kick off of the 2015 Carnival which was hosted by CTV Toronto host Colin D'Mello and CP24's Anchor Pooja Handa. 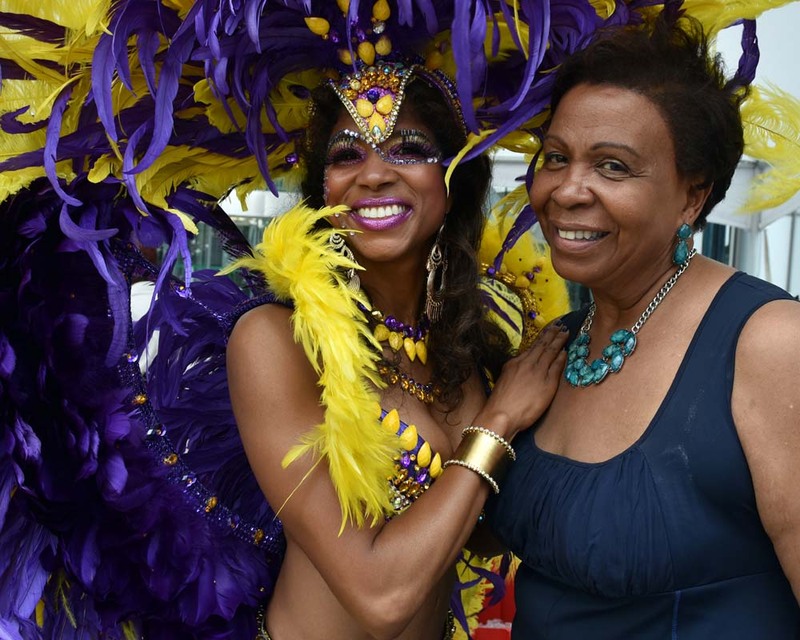 Members of the local Canadian Caribbean community, Salmon Cupid and the All-Stars steel pan band, calypso singers and Caribbean Dancers joined a colourful parade of Mas players to begin the 48th annual Carnival. When: National anthem at 11:55 a.m. sharp. 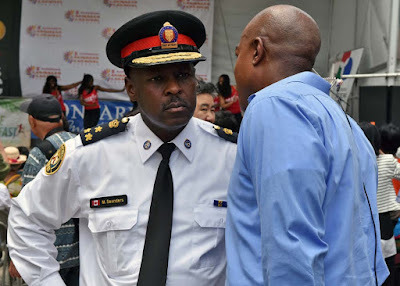 Speeches from 11:59 a.m. to 12:30 p.m. Caribbean entertainment until 2 p.m. Entertainment resumes at 4 p.m. to 8 p.m. Where: David Pecault Square, Metro City Hall at 215 King St. West. The culmination of the Caribbean Festival is the Grand Parade on August 1, 2015, beginning at 9:30am and running into the night, within Exhibition Place and running along Lakeshore Boulevard. 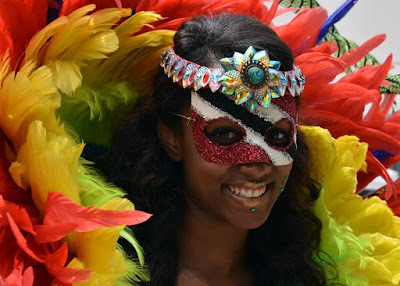 The paid event showcases steel bands and teams of masqueraders in an spectacle of beauty and music. 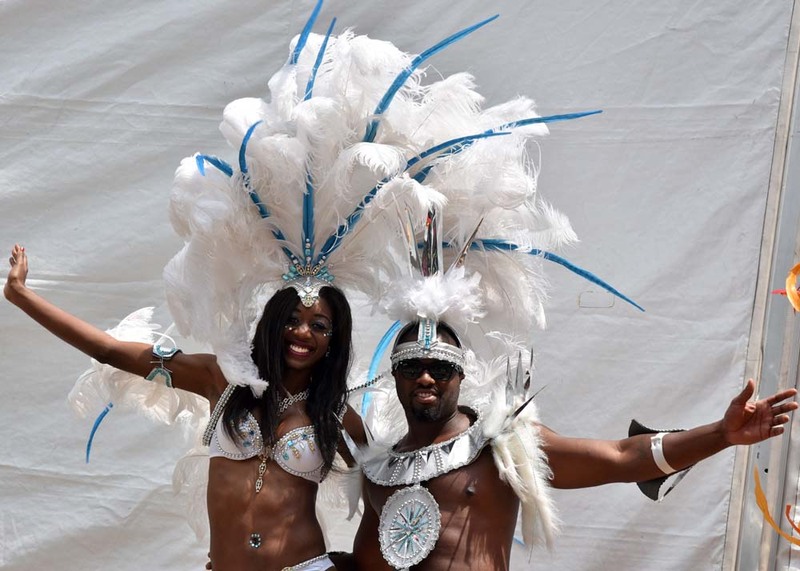 Grand Parade: "Good for family, couples and singles. Be prepared for the sun. 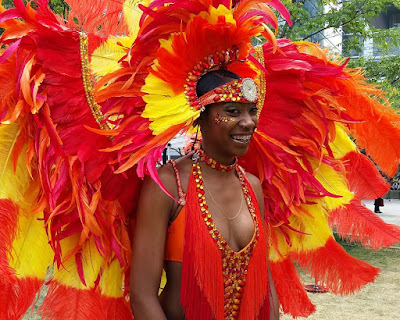 The biggest Carnival party in North America! The marquee parade is the showcase of the Festival. After months of preparation, masqueraders in colourful and striking costumes and steel pan bands wine their way from Exhibition Place along a 3.5 kilometre stretch on Lakeshore Boulevard. 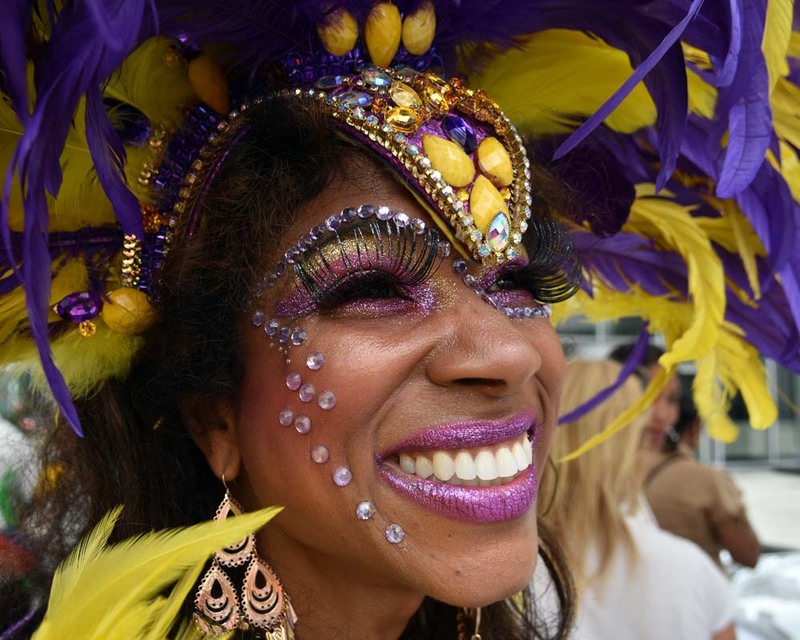 This performance of bejewelled masqueraders continues to draw millions from all over the world to see the live performing street art year after year. With opportunities for VIP seating in designated, controlled areas, which will include upgraded seating, tents, and marketplace." See more Mas after the jump.